Every weekend I look forward to visiting our local Farmer's Markets. Having no less than 3 markets that I regularly attend, I consider myself lucky. Fresh fruits and vegetables are currently so beautiful and plentiful that I'm having a hard time resisting the urge to scoop them all up to bring home. Summer produce is my favorite, and our cooler than average San Diego summer has local produce running a tad behind schedule, which is just fine by me! In addition to flavorful sweet onions, succulent avocados and gorgeous salad greens, this week's market provided a bounty of fresh tomatoes. Heirloom, cherry, and Roma were among the many varieties that found their way into my bag, all looking to be at the peak of their season! 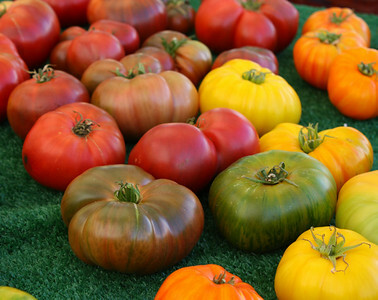 The irregular yet inviting shapes of the heirloom varieties always catch my eye and are hard to resist... before I knew it I had a bag with more than I knew what I was going to do with. Somewhat concerned that I had overdone it, I searched for recipes using pounds of tomatoes and thankfully remembered one of our favorites, Ms. Krieger's Roasted Tomato Black Bean Soup. Perfect selection of my treasured heirlooms! The versatility of this savory recipe is a benefit for me as I don't always have just the right amount of tomatoes on hand, but using a few more or less doesn't materially impact the soup other than making it more or less tomatoey. The black beans give texture that I love and adding roasted sweet onions lends a savory touch when combined with the roasted garlic. Topping the soup with a sprinkle of cilantro, a scoop of creamy sour cream and a spoonful of luscious diced avocado provides a meal in a bowl that is just as good, if not better, the next day! Perfect for freezing, I try to make extra to have on hand for those "I don't feel like cooking" days. Soup with a side of our favorite focaccia! Roasting to perfection on the grill! Preheat the oven to 375º. 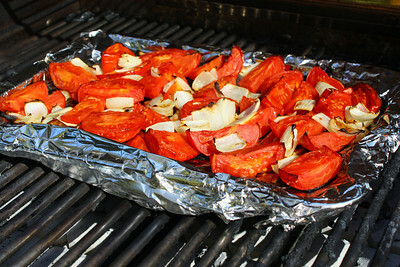 Toss the tomatoes, onion and garlic with the oil, salt and pepper in a large bowl, then transfer to baking sheet. Roast until the garlic cloves have softened, the edges of the onions are browned, and the tomatoes have collapsed, 35-40 minutes, stirring once after the first 20 minutes. Alternatively, put your baking sheet on your grill over medium low heat and roast... I found mine were perfect at about 20 minutes. Transfer the roasted vegetable mixture to a 4-quart saucepan. Add the broth, water, beans, and cumin. Bring to a boil, reduce the heat, and simmer for 10 - 20 minutes. Adjust water as necessary. Remove from heat and blend until smooth with an immersion blender or in batches in a regular blender. Stir in the hot sauce, using more or less as desired. 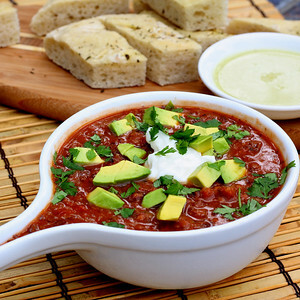 Scoop into bowls and garnish with a dollop of sour cream, a scoop of diced avocado and a sprinkle of cilantro. This post is submitted to Kahakai Kitchen's Souper Sundays! One of my FAVE dishes! I love that you grilled the tomatoes, excellent idea!!! And gorgeous photos as usual. Have a great day! This looks heavenly. I think our summer is over and it's going to be time for soup. Will you look at those beautiful tomatoes. This recipe sounds devine. This looks great and I am gonna have to give it a try! I'm always looking for those recipes that freeze well! I do the same thing! See something beautiful at the Farmer's Market, scoop them all up and then realize I've got to figure out what to do with everything! It's fun though! This looks delicious and I love tomato soups, in general. I will definitely have to try this. Looks fantastic, Kim! And if I went a little easy on the beans, I could eat this without too much of a blood sugar rise. So good! Another beautiful Top 9 photo! This recipe looks great and so are your photos. Congratulations on making Top 9! oh my! this looks so good. I could eat it right off the page. Congrats on top 9 at Foodbuzz. The photos are as always, beautiful to salivate over! Oh my word this looks so delicious!! Yumm! I am gonna have to make this soon, my mouth is watering! Congrats on making the top 9 with this one! Looks delicious! Your soup is so colorful and delicious looking. Great photo too--congrats on the Top 9! This soup looks even better than it sounds! I haven't been to our market in a few weeks and from what I hear the produce is fissling out early. There was a huge selection of heirlooms at the store though and I came back with a load of those! :) This recipe sounds perfect for a wet rainy Washington day and thank you for mentioning freezing the soup. I never know what will freeze well and what will turn out watery and undesirable. Yum, that looks delicious. I love the color and the grilled tomatoes. Thanks for passing her recipe along. Now that our weather is cooler I'm in the mood for soup. We even had a little rain today! I didn't puree all the beans and used habanero Tobasco and we loved it. My husband found a new use for the soup. He put it on a hot dog for lunch! I just came across this beautiful soup! I love roasted tomatoes and how interesting to blend black beans right into the soup. Black beans are full of fiber and protein, what a great addition.